I'm not the world's craftiest person, but I do love a good hands-on creative project. Last week I managed to work on a project I've been meaning to for - not joking - three years (at least!). My homemade, hand-stitched cushion cover. 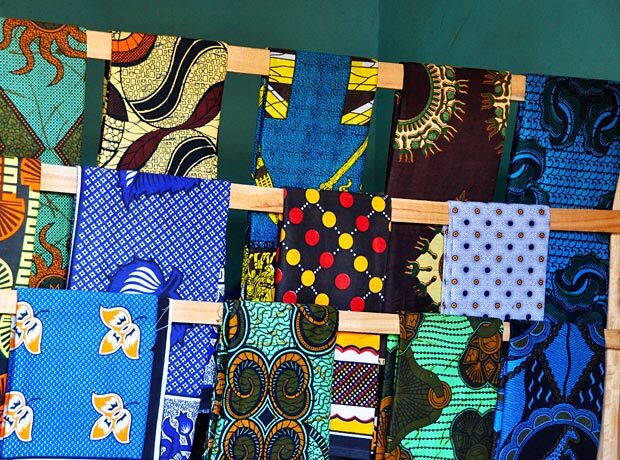 When I was in East Africa in 2012 I bought some gorgeous fabric. Anyone who has been to the region knows the incredible textiles that are used in dress and for decoration known as khanga, or the thicker kitenge. Typically made of cotton and woven in Kenya and Tanzania, it's impossible not to admire the beautiful colours and bold prints on this traditional cloth. The markets are filled with stalls and shops selling the cloth, and I loved seeing the women wearing these beautiful garments everywhere we went on our travels. I only bought a few khangas (perhaps subconsciously knowing it would take me years to use them), but every time I look at the beautiful materials I'm taken back to Tanzania and the sights, smells and sounds of that magical country. Fast-forward to last week - I finally made one cushion cover with the fabric. I made it by hand because I don't have a sewing machine, I'm not great with a sewing machine, and it was nice meditative work at the end of my busy days. calculations for measuring the fabric. finished seams and pinned the pieces together. I followed the clear guidance of Hey There Home and was amazed at how easy it was to create this cover, even for a sewing novice like me. If you've been wanting to freshen up your home without spending a fortune, I can vouch for the ease of making these envelope cushion covers. I am going to make a few more to sit alongside this beauty (this project didn't even use a quarter of the fabric), and keep thinking about what to do with the other cloth I have. How great are these colours?! I love filling my house with memories from my travels, and was glad to reuse an old cushion that was worse for wear (and not matching my current colour scheme). Have you worked on any fun, crafty projects lately? I'd love to hear about them!